I am currently in full out marathon training mode. This will be my 12th full marathon and from 5k’s to triathlons, I have done well over a 100 races. You would think by now I have learned to not over analyze and beat myself up over a bad race, season or even one little run. Yeah, not so much, still happens! Last Thursday, I had an easy 8 miler on my schedule. Just two days prior, I had one of my best speed workouts in as long as I can remember. Though my legs were feeling the effects of pushing it that much, I was still on quite the runner’s high! So what I thought to be a smooth recovery run turned into a very frustrating 8 miles of me questioning everything from my pace to my plan to my goals, and even if distance running is for me!?! As I whimper back to my car with my head held low in disappointment, I realized something. I NEEDED this run. No, I didn’t need for it to be good, I actually needed it to be bad. I got exactly what I needed out of that run. I mean, am I wrong here!?! Seriously, it’s those runs that chew you up and spit you out, leaving you questioning your running, your goals and even your life, that you can truly learn to appreciate the next time you go out and freaking rock a run. My rough Thursday run was just what I needed to not only appreciate my awesome speed work from earlier in the week, but I ended up having one of my best long runs in I don’t know how long this weekend and another incredible speed session this week. Not because I gained this tremendous amount of fitness, but because I gave myself some grace from the rough one and was ready to redeem myself when my body and mind were ready! Whenever a run goes south, it’s easy to first consider <blame> all the outside factors. I for one am baaaad about this, especially during summer training. Because, well it’s like surface of the sun hot here with absolutely insane humidity. I mean, how could 90+ temps with 100% humidity at 7:30am not have a negative effect on a run? But the truth of the mater is, I cannot change the weather, only my attitude and how I prepare for it. I KNOW I need to adjust my pace, hydrate better, take salt tablets and just respect the fact that I cannot perform at peak in such conditions. But I often set myself up for failure expecting to have an amazing run in less than stellar, in fact downright brutal conditions. Regardless if it’s the weather, dead headphones, nutritional mistakes, or simply running out of steam at the end, there are always factors we can look for and work to change for our next run. By analyzing a sub par run (without dwelling and beating yourself up over it), you can figure out what adjustments can be made to prevent those things from happening again. 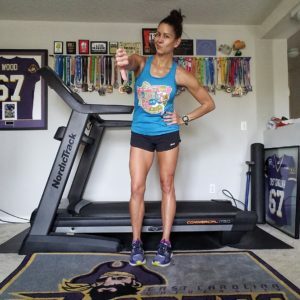 Whether that’s nutrition, hydration, gear, route or even who you run with, recognizing and making small tweaks after those not so good runs can cause them to become few and far between, leaving you as physically and mentally prepared as possible come race day. The other day as I was struggling through my run, wondering why my 8:30 pace felt a little tougher than usual and that there is NO WAY I could race my old 7:30 pace for a half marathon soon, if ever! But then I am reminded of when I first started running and couldn’t even make it a hundred yards to the next stop sign without thinking I was going to die. Or the time in college when I failed the 10 minute mile and almost had to change my major if I couldn’t pass the physical fitness test to declare. Or how about the almost 5 hours it took me to complete my first marathon (which I am and always will be damn proud of that finish time, I fought HARD for it!). So yeah, I’ve hit a bit of a slump, or had a particularly rough day, it happens. I may not be exactly where I was a year or so ago when I felt at my “prime” but I have come a helluva long way from when I started. And that is something special to be reminded of. I remember when I came back to running after having my children. I made a significant amount of progress in a short period of time. My ceiling for improvement was pretty high then, so each and every run then race went better than the last. Until one day it didn’t. Had I peaked? Was it all downhill from here? No, it just made me take a step back and evaluate things. It turns out in my relentless pursuit of my goals, I had lost sight of what was important. While I was out racing every weekend, pushing every workout and obsessing over every last detail of running, I was neglecting my priorities to my cross training and nutrition, my career and at times, I hate to admit it but my family. Though my racing career had been going great, it would all come to a screeching halt thanks to over training and burnout. Luckily all it took was a couple of poor races, thankfully no major injuries or illness, for me to realize that. Who knows what could’ve happened if I had not been humbled and force to slow down for a bit!?! Thanks to a little slice of humble pie, I was able to get my priorities in check, focus on getting stronger inside and out, and now I’m a better athlete, coach and even more so, wife and mom, because of it! No one is immune to a rough run or season every now and then. NO ONE. It happens to the best of them. Knowing that it’s “normal” for all runners at any level helps to make it a little more bearable when we experience it. Keep in mind what makes you a stronger runner for it is what you take away from those rough runs. Strong runners don’t let those bad runs define them or send them into a downward spiral. Strong runners realize it happens, focus on what they can and cannot control and use it all to fuel their fire to bounce back. So the next time a run doesn’t quite go your way, don’t beat yourself up. Allow yourself some humility and grace, dust yourself off, make some adjustments if need be, and get back after it. You’ll be stronger for it, I promise!